A new study finds "NASA satellites may have missed more than 50% of the phytoplankton in the Southern Ocean, making it far more difficult to estimate the carbon capture potential of this vast area of sea." The paper adds to several other recent peer-reviewed publications demonstrating prior assumptions about the global carbon cycle may be highly erroneous, as well as the modelling derived from these assumptions. However, Trenberth's imaginary heat from CO2 is still 'missing' from both the atmosphere and the deep oceans. The very sparse, deep-ocean temperature observations show only a 0.01C/decade warming from 1955-1999, which is much, much less than the instrument uncertainty. In addition, if the "oceans ate the global warming," steric sea level rise from thermal expansion should have accelerated sea level rise, but the data shows no evidence of acceleration. To get the observations needed to make valid comparisons and develop the algorithm, the researchers used more than 1000 Southern Ocean phytoplankton samples collected over 10 years and compared these to satellite measurements. 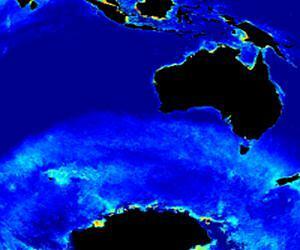 But now, new research published in the Journal of Geophysical Research, Three improved satellite chlorophyll algorithms for the Southern Ocean (doi:10.1002/jgrc.20270), has led to the development of an algorithm that produces substantially more accurate estimates of Southern Ocean phytoplankton populations. "This new algorithm allows us to detect changes in plankton numbers that have previously gone unnoticed," said Mr Johnson. "This better understanding of the phytoplankton population will, in turn, allow us to gain a much more accurate idea of how much carbon this ocean can take up." The importance of phytoplankton and their role in our planetary ecosystem cannot be underestimated. They form the base of the marine food chain, produce half the oxygen on Earth and are partly responsible for the ocean uptake of at least a third of total human induced CO2 emissions. So it was important to understand why existing ocean colour satellites systematically underestimated the chlorophyll concentration (a proxy for phytoplankton biomass) of the Southern Ocean and Antarctica. The majority of the samples used in this study were collected by the French Antarctic vessel MV L'Astrolabe through a collaborative and long-term monitoring program between the CSIRO, the Australian Antarctic program, and the French Antarctic Program. Once this observational data was collected, the new algorithm was used to process satellite data and make comparisons. It quickly became clear that the algorithm produced a much closer estimate of phytoplankton numbers than past satellite measurements. "Our improved satellite chlorophyll algorithms will be used to produce higher-accuracy observations on the vitally important phytoplankton of the Southern Ocean and Antarctica," said Assoc Prof Peter Strutton. "This will go a long way towards improving our understanding of how the Southern Ocean works and how the movement of carbon is changing in these remote waters." However, Trenberth's imaginary heat from CO2 is still 'missing' from both the atmosphere and the deep oceans. That's because it has gathered itself up and travelled to the Earth's core! That way no one will be able to find it. Global warming isn't just extremely dangerous it is also sneaky, using gravity to overcome entropy. Thanks for the link. I see you wrote that one and it is quite true. "The proponents of AGW seem to think that heat only (or mainly) travels by radiation. They then accuse sceptics of totally ignoring radiative properties." In fact in general it seems to me that all parties (at blog level) ignore the thermal transfers. It is quite easy to show that if we turn off the greenhouse effect by preventing certain wavelengths from radaiating from the surface that the amount of "back radiation" stays the same. Reason? The energy equivalent warms the atmosphere directly. The big problem that warmists have is if they consider thermal to (back) radiation effects via GHGs they must also consider thermal to (forward) radiation effects. This shows directly that GHGs increase outgoing radiation from the planet and even they would have difficulty in explaining how GHGs radiate additional energy out into space and in doing so warm the planet! GHGs act as a planetary thermostat/negative feedback. Per the SB equation, if temperature increases, GHGs increase their radiation to space at the top of the atmosphere exponentially to the fourth power and vice-versa. I note your use of "top of the atmosphere" which seems to me rightly to limit the cooling effect of GHGs somewhat. However as I am sure your are aware a cooled upper atmosphere implies a cooler lower atmosphere via the lapse rate law (which doesn't quite apply as the Earth is heated from above not below). However the cooler air will fall and be reheated by lower warmer air so gravity is important in practice. Interestingly gravity can be seen as though "squeezing" radiant energy out of the lower atmosphere. This is because "at equilibrium" there is a continuous flux of of radiant energy interacting with GHGs via absorption/emission events. As gravity makes the atmosphere more dense in the downward direction the mean free path between these events is shorter for photons emitted in the downward direction. In other words while radiation is emitted isotropically on average it will travel further when it has an upward component. We see therefore two further ways in which GHGs cool the planet. The point I make I suppose is that unless thermal to radiation energy changes are considered we do not have a complete picture. It seems to me for example that as CO2 levels increase the rate of thermal to radiation conversion increases linearly with CO2 concentration (at constant local atmospheric temperature) so the amount of back radiation increases in the same manner. (The surface radiation to back radiation interaction is of course exponentially saturating.) If I am right on this point then the global warmists appear to have missed a trick as thermally sourced back radiation goes ever upwards with CO2 concentration. That at first sight would appear to give much added strength to the GHG theory. So either I am wrong in some way or for some reason they are completely blind to this apparent advantage for "the cause". The currently fashionable explanation of the GHE is that increased GHGs cause the ERL [effective radiating level or height in the atmosphere] to increase. Since it's colder at higher levels in the atmosphere, GHGs will radiate less if the ERL is higher in the atmosphere. This is all theoretical. I asked Science of Doom a long time ago to show the observational evidence of this & he couldn't find any. The way I see it is if T increases, OLR from GHGs to space exponentially increases to the fourth power. Interesting, I hadn't considered the "squeezing" effect you propose, but makes sense to me. Interesting indeed. The "squeezing effect" came off the top off my head and I have since realised it is something which may be important. That it is possible that this may be the "effective equivalent" of GHGs radiating anisotropically! That is: effectively net upwards! I must have a look at this. I bet it isn't in any computer models. I will have a look at your link and arguments later. In the meantime what does OLR mean? I think I had sussed that water vapour is the main regulatory thermostat but need understanding so you are helping me.